On August 29th the WECC business lounge hosted Mr. Tim Briercliffe – General Secretary AIPH (International Association of Horticultural Producers). Mr.Mucahit SENGUL Secretary General of WECC(Ex Dpty.Secretary General of Expo 2016 Antalya) presented final report of Expo 2016 Antalya and Mr. Tim Briercliffe ,The Secretary Of AIPH presented the Association to the Expo Commissioners and focused his presentation on the next Future Expos worldwide that will be organized by AIPH : Taichung World Flora Exposition 2018/19, Greentech Trade Show 2018 Amsterdam, International Horticultural Exhibition 2019 Beijing, Australis 2020, Australia, Expo 2021 Yangzhou (China), Floriade Amsterdam Almere 2022. 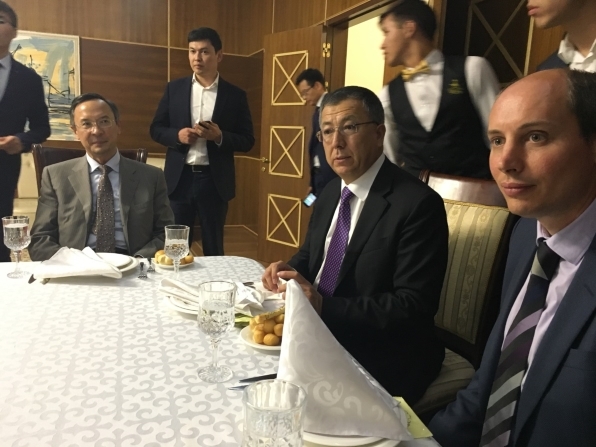 Mr. Tim Briercliffe met also Mr. Kairat Abdrakhmanov (Minister of Foreign Affairs of Kazakhstan), Mr.Zhanseit Tuimebayev (Governor of South Kazakhstan), Mr. Akhmetzhan Yessimov (Secretary General of Expo 2017 Astana) and some country Commissioners interested to become AIPH affiliate Members. This represents the enlargement of the Association with many new Countries members every year.